Look at this great new site! Built for the U.S. 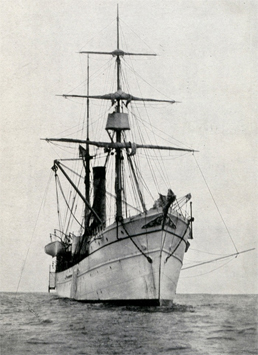 Fish Commission, the Albatross was launched in 1882 as the world’s first large deep-sea oceanographic and fisheries research vessel. A long time ago, when we were a tiny bloglet, still at the conceptual stages, we thought it would be great to start assembling some of the fabulous content about fisheries that is available on the web. We never quite got to having the resources to do that but we’re thrilled that the Alaska Fisheries and Science Center (AFSC) , a part of the National Oceanic and Atmospheric Administration (NOAA), has come up with this website looking at the center’s work and the development of fisheries in the Pacific. The site appears to have a great deal of content. We were especially pleased to see, for example, on the page for the great biologist Charles Gilbert, links to the excellent history of his work by J. Richard Dunn. There are also links to some very nice papers, many of them published in Marine Fisheries Review, always my first stop when we’re looking for some background information. We’ve bookmarked this site and we’re sure to be going back to it as we continue our research into the development of fisheries in the Pacific. This is a huge and welcome contribution. This entry was posted in Charles Gilbert, Environmental History, Fishing, History of Science, History of Technology, Maritime History, Ocean fishing, Pacific Fishing History Project, Resources About Fishing and tagged National Oceanic and Atmospheric Administration. Bookmark the permalink.